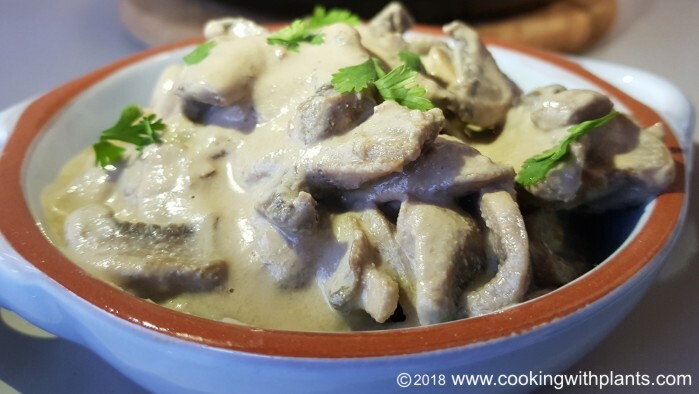 This creamy mushroom stroganoff recipe is great for anyone that wants a super tasty dairy free and meat free version of traditional stroganoff. Note: click here for the creamy dressing recipe I refer to. Place sliced mushrooms and vegetable stock powder in a fry pan over medium to high heat. Pour over the braggs aminos and stir for a few minutes until mushrooms are softened to your liking. Take pan off the heat and stir through the dressing. Serve with your choice of pasta or rice. Note: click here for my creamy dressing recipe that I refer to. My husband has been told to cut out salt from his diet due to heart issues. Do you have recipes or suggestions that would help me prepare food that still tastes good? Just use lots of fresh herbs, spices and salt free vegetable broth. madam kindly send me only vegan recipes. Can’t wait to try your stroganoff! I was wondering if you are by any chance working on a weight loss program at all? I really need to loose about 20 lbs but menopause is really making it difficult! Thought I read somewhere that you were working on something? I am really desperate to find something to follow.. any suggestions? Yes, I am working on it and should have it done by march/april. So glad you’re back! You look great! You’re recipes all look so delicious, can’t wait to try this one! BEEF BROTH is VEGAN??? I don’t think so. A good veggie broth powder (or home made), would be a good choice for being truly VEGAN! A good recipe, thanks! It is NOT beef broth. It is a vegan stock powder by Massel that is called “Beef Style” because of the rich taste that it has. I am vegan… I would never promote the use of animal products in any of my recipes! Hi Anja, A belated Happy New Year. Thanks for the recipe email, will be trying it tomorrow night for dinner along with Zucchini noodles. Got to get on top of the Zucchini glut growing in the garden at the moment. Great to see you are back and I’m looking forward to more of your recipes. Thank you so much for your lovely comment… the garden full of zucchinis sounds amazing! So glad you like it as much as I do 🙂 It’s great to be back! I personally don’t drink coffee because I don’t like the taste of it… however, it seems like the best way to prevent curdling is to warm the soy milk slowly by pouring it into the cup first, then gradually add the coffee. Letting the coffee cool a bit before adding soy milk and avoiding more acidic coffee beans may also help. Hi Anja ! This recipe is delicious. Too good for me to stop and take a picture!! Only thing I found it very salty. I used low sodium tamari. Any suggestions. Really delish though! Thank you.